It isn’t hard to spot a cluttered roof. You might be out on a daily walk or just driving down the street but debris-covered roofs are a dime a dozen in the Barrie area. Just because having a cluttered roof is common practice does not mean that it is right for you. The state of your roof affects not only the aesthetic value of your property but it can impact the structural integrity as well. When you want to keep your property looking great and running smoothly, our Barrie roof cleaning and moss removal can help. It is easy to forget how important your roof really is. It just sits there, silently, taking care of your customers or family. Yes, taking your roof for granted is easy but it does come with some consequences, namely repairs, replacements and a whole lot of bills. It can be hard to diagnose issues with your roof when you can’t get a good view of its surface. When organic debris is cluttering your roof, it prevents you from seeing any moisture damage or moss growth that is forming underneath. As the climate takes a turn for the damp, moss feeds off of the moisture in the air, rain and snow melt that falls, as well as condensation that builds in cold weather. This means that there is a lot of obstacles between you and a clean roof surface. As moss has the opportunity to grow, it becomes invasive. Moss spreads over surfaces and can make its way underneath shingles. The shingles around your property are designed to keep debris and water out but they can’t do their job when they are constantly under attack. When moss breaks through that single barrier, it carries moisture with it, which can wear away and damage the overall structure of your roof. Instead of putting up with damage and repairs, call our Gorillas for your routine Barrie roof cleaning and moss removal. When it comes to your Barrie roof cleaning and moss removal, there is always a bit of danger involved. There is the threat of damage to your property and the threat of damage to your body! Instead of taking the risk of a fall from a ladder, trust our sure-footed Gorillas to get the job done for you. 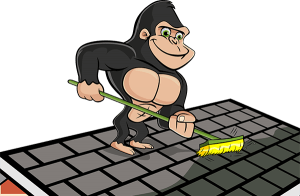 In addition to keeping our clients in one piece, our Gorillas use the right tools to clean your roof of clutter and moss without damaging any delicate materials.